This side dish recipe for Greek Pasta Salad has all of the refreshing flavors of a classic Greek salad with cucumber, olives, and feta cheese. 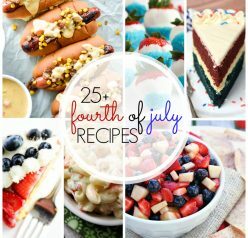 Everyone at your summer or 4th of July picnic will love this! Greek food, especially Greek salads, are a favorite of mine, but I’ve never applied the “Greek salad” concept to pasta salad before! I love this recipe because it’s not only a killer side dish for the 4th of July, Memorial Day, or really any summer picnic, but it really goes with anything. The spices and the red wine vinaigrette give this Greek pasta salad a wonderfully unique taste. What side dishes are you making for the holiday? I could actually make a meal out of side dishes (and do sometimes). In fact, I went to a party last weekend and skipped right over the chicken and made a meal out of the dips and sides. I’m weird like that! Mr. Wishes and I really liked this Greek pasta salad and he’s not usually one to like olives OR feta cheese, but it undeniably all tasted great together. I just love the freshness all of the ingredients give it. I also have a slight obsession with Kalamata olives. I think I might even be more odd and add toasted pine nuts next time! If you’re loving summer pasta salads, be sure to check out my Classic Italian Pasta Salad made with pepperoni and my Avocado BLT Pasta Salad that’s creamy and loaded with crispy bacon – they are both family favorites! You can also check out my full collection of Pasta Salad Recipes. If macaroni salad is more you’re thing, you’ll love this Homestyle Macaroni Salad loaded with veggies from my friend Melissa. This side dish recipe for Greek Pasta Salad has all of the refreshing flavors of a classic Greek salad with cucumber, olives, and feta cheese. Everyone at your summer picnic will love this! Bring a large pot of salted water to a boil. Add the pasta and cook it until al dente (use the time on the pasta box as a guide). Strain the pasta and transfer it to a large bowl to cool while you make the dressing. Add the cucumbers, olives, and feta cheese to the bowl with the pasta. Mix the dressing ingredients, except for the salt and pepper, in a separate bowl. Pour the dressing over the pasta, tossing to combine, add salt and pepper to taste, then cover the salad with plastic wrap and refrigerate it for at least 3 hours or overnight for the flavors to fully come together. When ready to serve, toss the pasta salad again. Adjust seasonings as needed. Serve cold or at room temperature. This salad looks perfect for a Summer bbq! We love Greek food and adore our city’s annual Greek Festival. 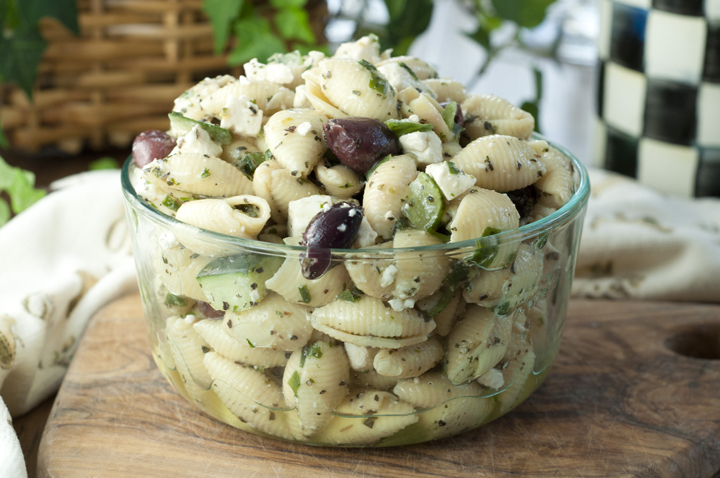 Now that it’s over (boo hoo), we need to find a way to get our Greek fix… like this awesome pasta salad! Yay! Greek salad in any form is always a winner. 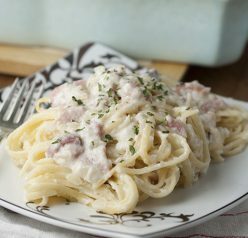 I love that your’s has plenty of feta tossed in with the pasta. Not weird at all – sometimes the sides are the best! This pasta salad definitely sounds like something I could make a meal out of – love the flavors. You are not weird for making a meal out of dips and sides. I could make a meal out of this pasta salad alone! I love salads in the summertime Ashley – and this is a great one to add to my rotation! My husband doesn’t like feta at all either! Or Cilantro for that matter…I always make a JK batch and an everyone else batch when those ingredients are involved. I’d eat your pasta salad right up! I saw this on instagram and I think on twitter yesterday and I just had to come tell you how much I love these flavors together! Greek food is so, so good! Oh yum! Love that you combined all those delicious Greek ingredients in a pasta salad. Great idea and great side for a cookout. I love the idea of Greek pasta salad! Haven’t had it before, but I will. 😉 Thanks for this. I love that you combined Greek salad and pasta together! Such a fun spin! 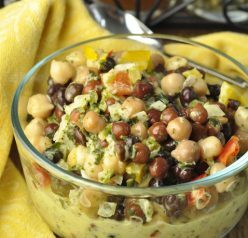 I am so with you – the side dishes are the best part of so many meals and gatherings! I guess it’s the same way that appetizers always seem to taste better than entrees at restaurants. 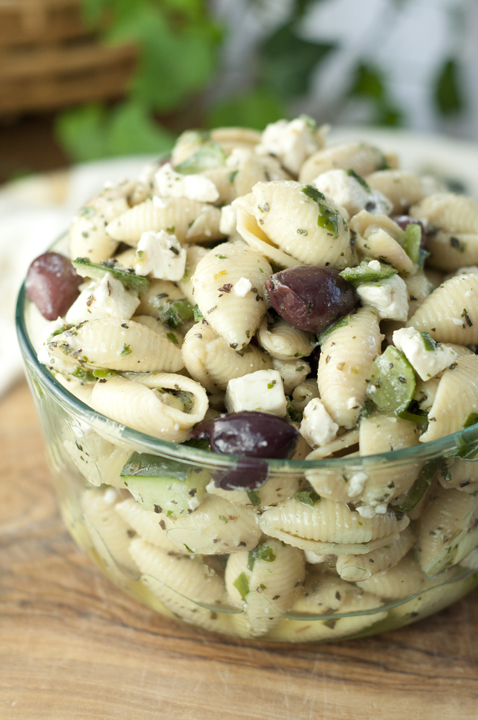 : ) Love this Greek pasta salad and it would go quick here! Enjoy the 4th! Yummy – we’re huge Greek salad fans and turning it into a pasta salad is such a great idea! Umm… I thought some side dishes were meals…maybe Im weird too lol I could totally make a meal out of just this Greek pasta salad! I love Greek inspired foods! YUM! I don’t know about those people that don’t like feta. 🙂 I would totally swim in a vat of this pasta salad, totally my jam! Love pasta salad at this time of the year — it’s a quick dinner. And you’ve packed a ton of flavor into this one! It looks great — thanks!